Over the last few years of devising conversational mentalism material Mark has developed several routines that are so powerful that they each demand a separate release. 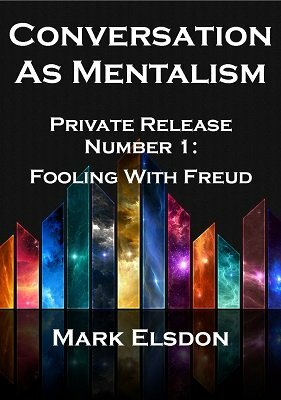 The first of this new Private Release series is titled Fooling With Freud and is a 100% practical piece of cutting-edge mentalism. As per the Conversation As Mentalism ethos you don't need to carry any props; this is a pure three-phase routine of direct mindreading - it doesn't use playing cards, iPhones, peek devices, stooges, guessing or the law of averages. What is the effect? In increasingly arbitrary ways, the participant merely thinks of something random (they never write anything down or tell anyone) and you simply reveal what it is. The routine builds through each of the three phases, ultimately leaving everyone involved to conclude that you really must be walking around inside their head! Perform it close-up, stand-up, on stage, in the pub or wherever you like. It works as well for a whole group of people as it does one-on-one. If you like Mark's CAM series you will LOVE this! If you've never read either of the CAM books, you'll still LOVE this. Exclusive Bonus: The booklet also includes Pulling With Freud - Colin McLeod's personal handling of Mark's mind-bending routine. Please note: this is a brand new, standalone release and does NOT appear in either of the CAM booklets, nor does it require any prior knowledge of CAM material.